The Christmas tree at Rittenhouse Square. Trees decked out in twinkling lights are a festive sign the holiday season is here. This month you can catch holiday displays and festivities, including from a former White House decorator and the Mummers, in neighborhoods across the city and in the surrounding suburbs. Below is a roundup of upcoming free tree lightings. The celebrations are fun for all ages, with many also including visits from Santa, live music and sweet treats. Former White House decorator Coleen Christian Burke will unveil a new holiday tree installation at the Bucks County Visitor Center this winter. Burke, a Bucks County native, led the annual Christmas decorating efforts under both President George W. Bush and President Barack Obama. On opening night, Thursday, Nov. 15, Santa will arrive by fire truck to view the festive trees and pose for photos. While the event is free to attend, attendees are encouraged to bring an unwrapped toy to donate to Toys for Tots. The annual tree lighting celebration outside Woodmere Art Museum in Chestnut Hill will take place Saturday, Nov. 17. At the event, there will be caroling, hot chocolate, cookies and a visit from Santa, who will arrive on a vintage fire truck. Woodmere's holiday exhibit, "The Night Before Christmas," will also open on Nov. 17. On view will be watercolor paintings by Charles Santore, depicting the 1822 poem by Clement Clark Moore. Attendees of the tree lighting can help spread holiday cheer by bringing an unwrapped toy to donate. Adorned with glittering holiday lights, a gigantic holiday tree dominates the top of the Philadelphia Museum of Art’s world-famous steps, bringing a festive accent to the city vista. 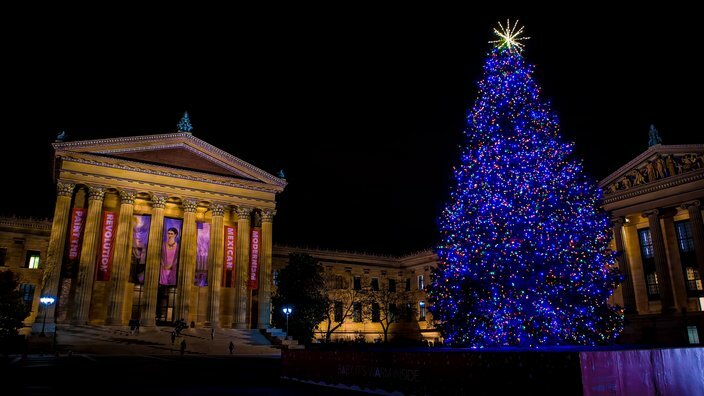 The Philadelphia Museum of Art's outdoor tree lighting celebration will take place on Wednesday, Nov. 21. The lights will go on at 6 p.m., with a performance by Motown band York Street Hustle leading up to it. Afterwards all are invited to head inside the museum – Wednesdays are pay-what-you-wish admission – to continue the festivities. Inside there will be a live choir and warm (and boozy) beverages. Visitors can also view the new exhibit "Fabulous Fashion." 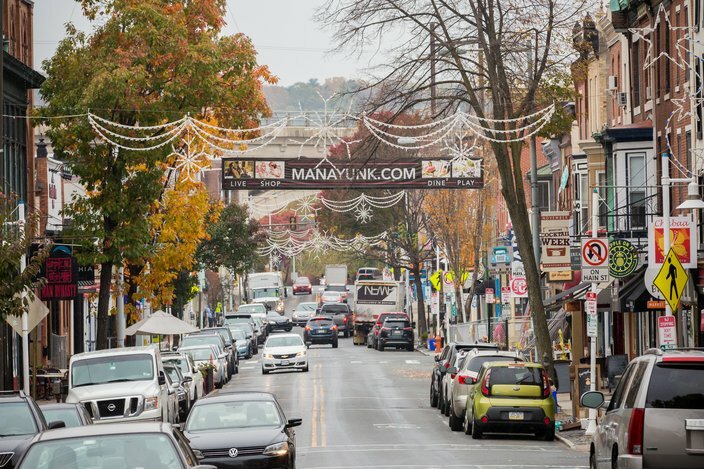 Small Business Saturday in Manayunk will take place Nov. 24. Shoppers are encouraged to browse local businesses for holiday gifts, before heading to Canal View Park for a tree lighting celebration at 5:30 p.m. The evening event will also include live music and a visit from Santa. The Promenade of Trees in Manayunk then launches Saturday, Dec. 1, giving people strolling down Main Street a chance to vote on their favorite festively-decorated trees out front of shops and restaurants. All the trees will be decorated to fit the theme "Christmas Vacation." 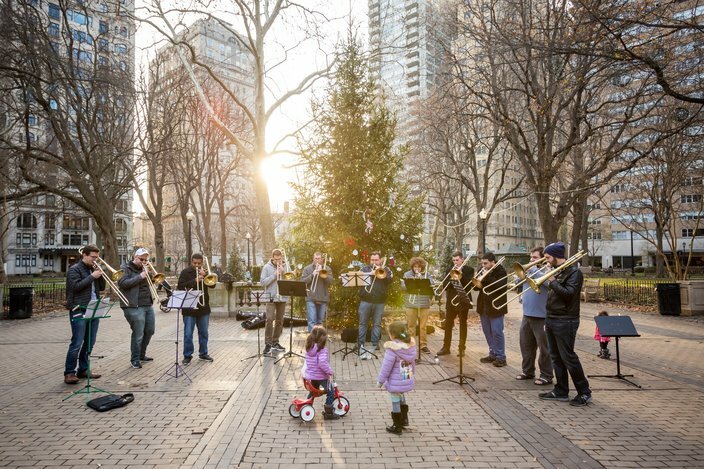 The Christmas tree at Rittenhouse Square was the backdrop for a series of holiday songs on a recent afternoon. 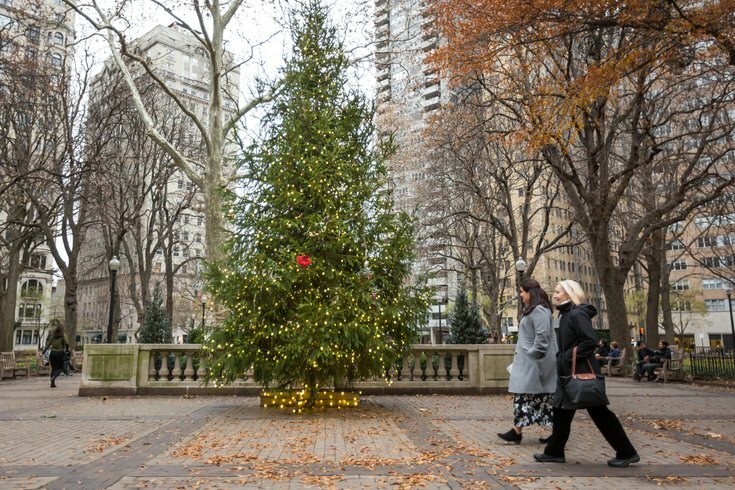 On Tuesday, Nov. 27, there will be family-friendly activities and live music in Rittenhouse Square Park, leading up to the lighting of a 30-foot tree. Through the end of December, the holiday tree and white globe lights in the surrounding trees will illuminate the park. This year, City Hall will be transformed into The Met Holiday Plaza, where there will be a 65-foot tree covered in decorations and lights. The tree's base will also be illuminated with visuals representing the city's skyline and icons. The tree lighting will take place Wednesday, Nov. 28. Attendees can grab a drink in the Craft Hall Pop-Up Restaurant, a heated tent with views of the tree. Also at City Hall this holiday season, visitors will find the Made in Philadelphia Holiday Market, filled with a variety of vendors, as well as a carousel and ice skating. Last November, Old City debuted a holiday tree in the courtyard of the Betsy Ross House. This year's tree lighting celebration will take place Thursday, Nov. 29. The event will include an appearance by Betsy Ross, music performances, and seasonal food and drink. Beginning Nov. 29, shops and restaurants in the neighborhood will also be competing in a festive window display contest. Starting at 5 p.m., on Thursday, Nov. 29, there will be holiday music at The Singing Fountain on East Passyunk Avenue, leading up to the tree lighting with CBS3 meteorologist Lauren Casey. Santa will also attend to pose for photos and there will be free treats from neighborhood bakeries. After the tree lighting, members of the Philadelphia Mummer string band and carolers will lead the crowd down the avenue. Attendees are asked to bring an unwrapped new toy to donate at the event. Stay cozy off the ice by the fire pits at Winterfest. 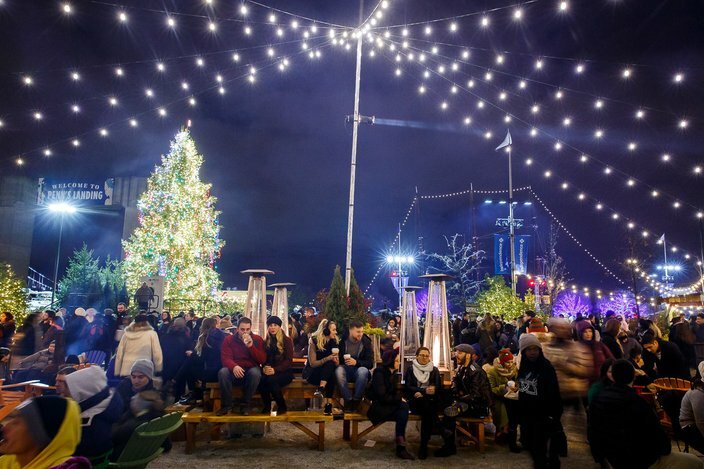 Blue Cross RiverRink will kick off its 25th anniversary season, and the sixth season of Winterfest, on Friday, Nov. 23. The waterfront attraction includes ice skating, a festive Lodge serving seasonal food and drinks, fire pits and twinkling lights. Opening week will end with a tree lighting celebration on Friday, Nov. 30. The event will usher in the holiday season with a full night of performers, singers, dancers and ice skaters. This year's headlining performers include local country artist Jackie Verna, a top 10 finalist on Season 14 of NBC's "The Voice," and Philadelphia-based singer-songwriter Bianca Ryan, the first winner of NBC's "America's Got Talent." After the holiday tree is lit, fireworks will cap off the night.